Police in Thailand are searching for an anonymous hacker after the Twitter account of prime minister Yingluck Shinawatra apparently was hacked. The account @PouYingluck was compromised early on Sunday morning and eight false tweets were posted criticising Yingluck's leadership of the country. Once the incident was realised Twitter temporarily suspended the account, which has close to 400,000 followers. As of the time of writing the account remains unavailable. Yingluck said that the hack was a violation of people's personal rights. She added that she would be taking a break from Twitter for an undetermined period. 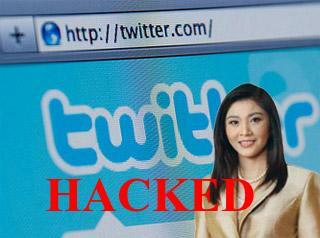 According to Anudith Nakornthap, the Thai minister for information, communication and technology, Yingluck's Twitter account was compromised after the hacker first gained access to her email, changing her Twitter password with the password reset feature. This suggests that she was not using the same password for both services, a common reason for Twitter hijackings, but it suggests that the password she used for her email account was not secure enough. The Thai police are following several clues that might result in an arrest.